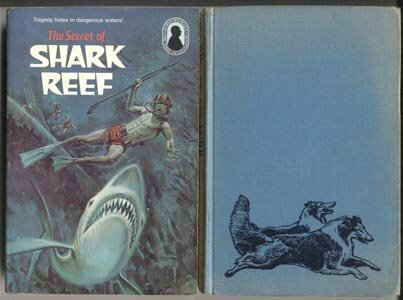 Random House, c1979, Lists to Shark Reef on Titles list in Back, number run 1234567890, 1st Edition, 181 pages. EXCELLENT Condition Illustrated Over-sized Softcover. This book has very light cover wear(see Scan), small stamp on fep & faint age yellowing inside covers. NO Spine Creases! Nice SQUARE SPINE!! Pages & Binding are NICE & TIGHT! This listing is ONLY for "Secret of Shark Reef". Alfred Hitchcock & the Three Investigators mystery series. Three young sleuths come to the aid of an environmentalist who is protesting drilling off the coast. The mystery has its roots in the happenings in World War II (WWII). Danger lurks on Shark Reef! Deadly sharks infest its waters. Jagged rocks threaten to destroy any passing ship. And buried on the reef is a secret that will spell disaster for one man if it ever becomes known. The secret might have stayed hidden forever--if it hadn't been for the arrival of The Three Investigators! The boys get involved in an environmental controversy with offshore oil drilling and an old WWII Submarine mystery.